Not completely dumb. If you charge the right rates you can earn great money. If not then you wont make much. I want moar neon if you plan on posting more i like the pickup/truck thing. I'll post more when i hit the road or get some good background pictures. What are you talking about? He has the straps attached in the correct places. He doesn't have it attached at the suspension. It's not connected to the front bumper. There are hooks under the car that he is using. The hooks are specifically placed there to be used for towing. Towing and hauling is diffrend things. Have you ever seen how car transport trucks secure load? Its becouse of suspension, you got it now? He has it connected the correctly. 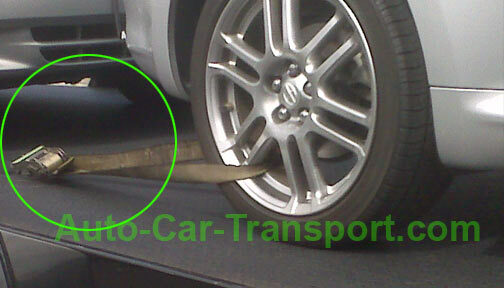 The tow hooks on the front of the car can be used for hauling. Its not best place to secure load, but if you tie it from those towpoints, need to make sure that you tie springs down, so it doesnt give 10cm movement on road. No need to sir me I was thinking, you have winch on that pickup, or how you tow car on trailer? Well i have another copy of this trailer with a winch but it was being worked on. So this one, i had to have my customer push it onto the trailer a little bit and then i use my straps to continueously pull it on the trailer. Ex: I strapped the front of the car and then winched the strap up a bit...undid it, then pulled the slack out winched it again and again until i got the car where i wanted it to be at.